I bought these mattress covers in June when my bed bug nightmare began. Our apartment was it was cleaned, washed, vacuumed, and nuked with heat, then we had the exterminator come and spray. No stone un-turned. When we put the covers back on the mattress and box spring we taped up the zipper area. two weeks later we found more bed bucks so we checked the mattress and box spring covers for holes. Didn't find anything. To be on the safe side I taped up the zipper area and the seams along the length of the mattress. Today, to my utter disappointment, I have found the flaw in this product. The corners where two sides and a top (or bottom) meet.... yeah.... THEY FORMED TINY LITTLE VILLAGES. In all 8 corners. The sewing on these isn't the best in these corners, so they can just crawl right through, feast on you, make about 60 babies, then go chill in their tiny village, or maybe go visit the folks in a neighboring one. Who knows? Their civilization was pretty complex. I ended up throwing out my mattress because I have given up hope. Home territory searches the web to find the best prices and availability on Mattress Protectors and related products foir your home like AllerEase Ultimate Protection and Comfort Waterproof, Bed Bug, Antimicrobial Zippered.... For this page, related items include products we find that match the following keywords: "Mattress Protector" at our vendor partner Walmart - Click More Info / Buy Now to check for price rollbacks!. 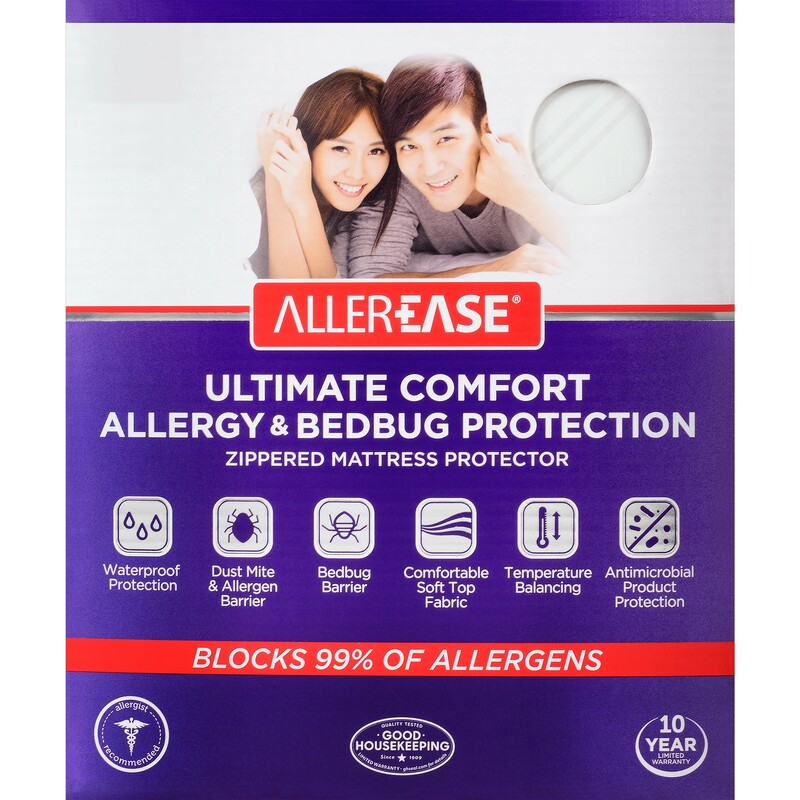 AllerEase Ultimate Protection and Comfort Waterproof, Bed Bug, Antimicrobial Zippered... is one of 83 Mattress Protectors and related products available for sale through HomeTerritory.com, If you have any questions on this product, please give us a call at 734-971-1210 during the hours of 9am - 5pm EST for assistance. Thank you for shopping at Home Territory, the home furnishings superstore!